Street and Bridge crews are responsible for repairs and maintenance in the city’s right-of-way (ROW), including public roads, alleys, sidewalks, multi-use trails and public trees. But did you know property owners are responsible for maintaining their trees and all other vegetation to the edge of the street or alley? To ensure ease of mobility and safety for all Austin residents, it is important to keep these areas free of obstructions. When notified, the City will prune or remove trees that pose a hazard to the public (dead, diseased, low limbs) and trees or limbs downed by storms. Crews and City contractors also perform routine mowing of medians and prune public trees along selected routes. Your cooperation is needed! Streets, sidewalks, and other public rights of way are for everyone’s use. Property owners are responsible for their private trees and all other vegetation in the public right-of-way next to their property. Overgrown vegetation is a safety hazard and limits the use of sidewalks, trails, streets and alleys. It further threatens public safety when vegetation blocks the view of traffic signs, signals, vehicles, or cyclists. Trimming vegetation and caring for your trees are effective ways residents can enhance neighborhood safety. Sidewalks: Limbs and vegetation must be trimmed back from the edge of and at least 8 feet above sidewalk. Streets/Alleys: Limbs and vegetation must be trimmed back from the curbline (edge of street or alley) and at least 14 feet above street or alley. Multi-use Trails: Limbs and vegetation must be trimmed back from the edge of and at least 10 feet above multi-use trails. Grass and Weeds: Maintain grass and weeds at a maximum height of 12 inches throughout property to the edge of the street or alley. Corners: Maintain vegetation at a maximum of 2 feet above ground within a 10 foot setback from the curbline (edge of street) and 40 feet along the curbline from the street intersection. Fire Hydrants: Remove trees or plants within 5 feet of fire hydrants. Do you have questions about right-of-way vegetation maintenance? Learn more. Watch the Public Service Announcement video here. Development Services Department | Community Trees | Austin’s urban forest is made up of trees, vegetation and other components that are invaluable to the wellbeing and identity of our community. Explore and learn more about this growing resource. Tree Care and Pruning: Proper pruning helps maintain good tree health and structure while influencing the health and well-being of a community. 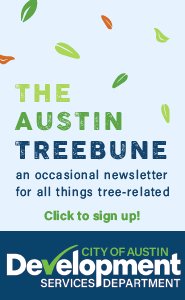 For advice on plant pruning around power lines, please visit austinenergy.com/go/trees. Remember to never prune within 10 feet of power lines. Learn more about Texas Oak Wilt. Oak wilt season is active. Pruning or wounding of oaks should be avoided during the spring months (currently defined as February 1 through June 30). 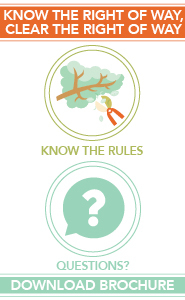 For more information see our Pruning Guidelines for Oak Wilt Prevention. For general questions concerning oak wilt, including a list of certified arborists, please refer to texasoakwilt.org. Dial 3-1-1 or use the 311 app by submitting 'Other' to report concerns about trees and vegetation in the public right of way.